“Just Culture” is the system we use to implement organizational improvement, presenting a set of design laws that influence our ability to create the societal outcomes we desire. Our five-skill model is designed to help change an organization’s culture by placing less focus on events, errors and outcomes, and more focus on risk, system design and the management of behavioral choices. 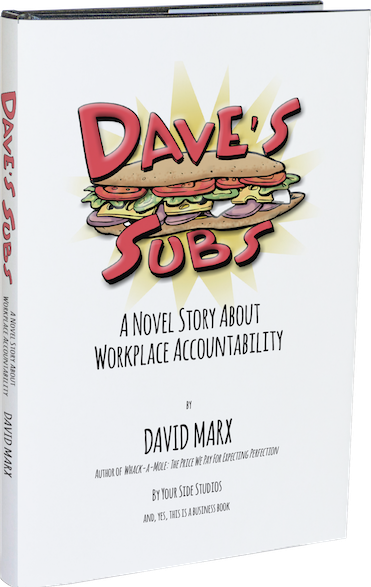 We do this by defining three manageable behaviors based on the choices of those in the system – human error, at-risk behavior and reckless behavior – and we strongly encourage the creation of an environment of free and open reporting within process systems. This helps to build a culture which encourages coaching and honesty at all levels, in order to bring about the best possible outcomes. Just Culture identifies five skills that make up the foundation of an organization’s culture. Values and Expectations – an organization must first define its mission. It then must determine what values it needs to hold up so that it can begin to establish reasonable expectations for its processes. In our imperfect, human world, perfection is not a reasonable expectation, so we must set goals that are realistically achievable. 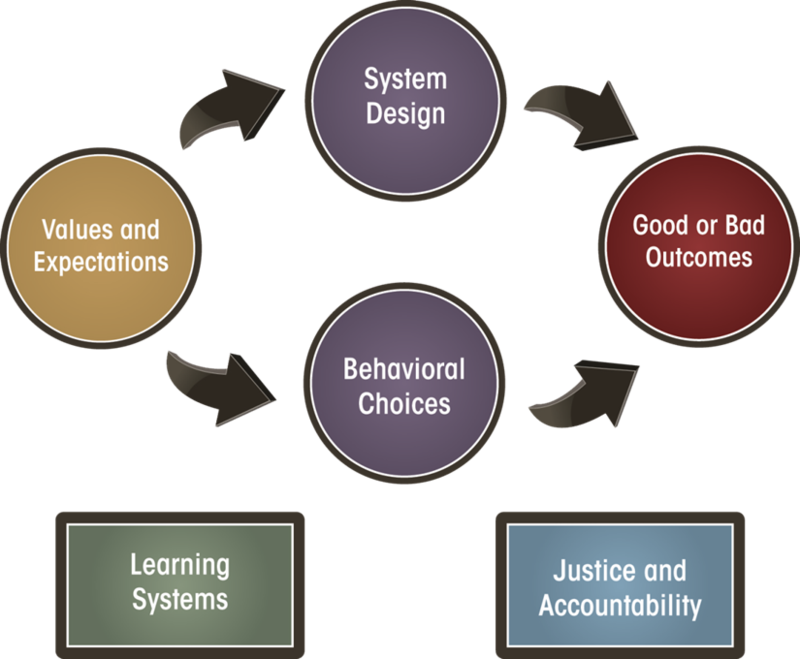 System Design – we must design our systems so that they facilitate people making good decisions, the decisions that will best support them in getting a job done safely and correctly. We must anticipate human error, capture errors before they become critical, and permit recovery when the errors become critical. 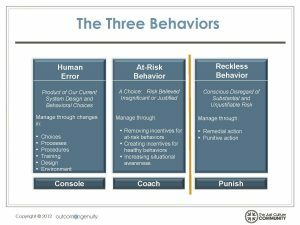 Behavioral Choices – we must coach our employees to be consistent and honest in their behaviors, and help them make the best choices and learn from their mistakes. We must also learn how to use remediation and discipline to the best effect in order to shape the choices of our employees. Learning Systems – we must work toward a learning culture, a culture which encourages early identification of risks in the system. It should promote honesty and forthright sharing of “near misses” in order to improve the overall success of the process. 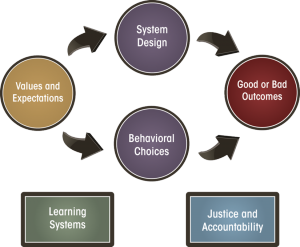 We cannot wait for negative outcomes to occur before we find ways to improve the system; the more we know beforehand, the more we can avoid the bad outcomes. Accountability and Justice – the organization must promote fairness and justice in the disciplinary process. It must find the balance between assigning blame for simple errors and never holding anyone accountable for their choices. Sometimes the system is to blame rather than a human component of the system, and we can change the system accordingly to reduce the risk of error or negative outcomes. Humans are not perfect, so any system we create should expect errors to occur and account for them as a normal part of the process. A slip, a lapse, a mistake can happen to the best of us, so human error, rather than being a punishable action, becomes an opportunity to learn and to improve our systems. Any system that is one failure away from harm, be it human error or equipment failure, is vulnerable. Sometimes people get complacent and start to drift away from the rules (like driving a few MPH over the speed limit, for example); they begin to engage in at-risk behavior, placing themselves and others at risk. They could be trying to accomplish more than they normally could, or they could be telling themselves that “it can’t happen to me.” Simply put, they do not perceive the risk, or have temporarily forgotten it. In this case coaching and education are the answer, a reminder of the risks that may have been forgotten or mistakenly justified. In very rare occasions, though, people engage in reckless behavior, choosing knowingly to place themselves or others in harm’s way. They see the risk, and they understand the harm that can be done. They simply choose to place their own self-interest above the rest of the system. The individual(s) responsible for these choices obviously need to be subject to disciplinary action. The Just Culture AlgorithmTM is our primary tool for understanding and categorizing the choices of those in our organization. With it we can evaluate an event based on a set of duties inherent to the system in order to determine which of the three behaviors was most likely in play. This gives us the ability to address the event and the people involved in a constructive way rather than simply reacting to the outcome. It can also show us how multiple behaviors can be associated with a single event, so that we can evaluate each behavior separately in order to more effectively determine the root cause. Click here for options to learn more about it. Below is a "Commitment Video" of an organization presenting its Workplace Accountability, Just Culture commitment to its staff. We produce these videos with our client organizations. For more information about what a Just Culture Implementation may look like for your organization, we're here to help. Use the CONTACT link above.